What Are You Doing to Remain Relevant? “Day 2 is stasis. Followed by irrelevance. Followed by excruciating, painful decline. Followed by death. And that is why it is always Day 1.” Those were the words of Jeff Bezos during Amazon’s all-hands meeting held last year in response to the question what Day 2 would look like. He continued with what he felt were some of the essentials for Day 1 defense, on how to fend off Day 2. Among these essentials was the eager adoption of external trends – “These big trends affecting our world are not hard to spot,…. If you won’t or can’t embrace them quickly – or if you fight them – you will probably be fighting the future. Embrace them and you have a tailwind,” said Bezos. I absolutely agree, and I like the aviation analogy! For those not familiar with aviation terms used as business jargon, a tailwind is a wind that blows in the direction of travel and increases an aircraft’s in-flight speed and reduces the time required to reach its destination. Thus, in business a “tailwind” refers to a situation or condition that will ramp up top-line or bottom-line growth, preferably both. Every organisation – both large and small, public or private, for profit or not-for-profit – should be aware of today’s big trends that can become tailwinds to a more prosperous future. AI is quickly becoming a mainstream obsession that will affect every industry. In aviation, algorithms are learning to predict aircraft delays, giving airports and airlines a better chance at avoiding them. Airlines like EasyJet and Emirates are using AI to redesign the ticketing process and improve the in-flight experience to cater to customer expectations. But the real promise is in the cockpit, where AI autopilots could help manage the complex airline operation and even respond to emergencies as they arise in the cockpit. For the moment, AI is augmented intelligence, i.e. man plus machine, where AI augments human performance. Instead of replacing productive workers, the use of AI technology will be pervasive – from piloting an aircraft, to aircraft maintenance and air traffic control, and to training and simulation – and is being used to amplify human performance. The introduction of AI will be subtle but it’s taking hold as the pressures to improve performance continues to grow. How can we exploit AI to enhance the performance of people? How can we delight our customers with new insights this technology can give us? Automation, driven by data analytics, AI and advanced hardware, is set to disrupt work as we know it. We’re automating traditional jobs out of existence on a regular basis. In the automotive industry, autonomous vehicles are fast-becoming a reality, and it will be a game changer for the trucking industry where it is forecast that there simply won’t be enough drivers. Similarly, with the forecast pilot shortage, it is not hard to imagine that remotely-piloted commercial aircraft – first for cargo, followed by passenger aircraft – will take to the sky. And, while still some years off, as AI and further automation takes hold, we will eventually see a transition from remotely-piloted aircraft to fully autonomous aircraft, capable of self-separation and flying the most efficient flight trajectories. The air traffic management function will therefore also see a major change, with increased use of AI and automation driving out the traditional function of the air traffic controller and heralding in the air traffic manager responsible for monitoring the efficiency of traffic flows. What jobs in our organisation are ready to be automated out of existence? What skills and capabilities do we need to build, and what does this mean for our training and development programs? Brought on by digital mobile technology and the online economy, customers today want companies to provide a consistently wonderful experience from beginning to end. And, if the experience meets expectations, customers will be willing to spend more. We’ve seen this with Apple, Nike, Starbucks and other brands that have created a following and an entire ecosystem to support the customer experience. There is no reason not to expect the same will happen in air transport where offerings are marketed that uniquely cater to the traveller’s needs and desires. Customers are looking for travel companies that fit with who they are and what they value. They want to work with companies that support the values, causes and ideals they support. Quality is a given, and this is not something companies will be rewarded or recognized for. Quality is expected, and it’ll be an afterthought. This shift in consumer expectations will require a whole new approach to customer engagement, and some airlines have only recently started to explore how this can be achieved. What type of experience would our customers value most? What would have them coming back for more, and evolve into a following? While Bitcoin and other cryptocurrencies have received a lot of public attention lately, it is the underlying technology that is truly revolutionary and will disrupt several industries as well as government services. In essence, blockchain is a different way to process transactions or records that does not require intermediation. Put simply, blockchain is a ledger of digital events that can be shared and trusted without the need for central authority. Importantly, the blockchain resides in the cloud and isn’t located on only one computer, but on many computers, and every computer is directly in contact with all other computers in the blockchain network. Due to this constant synchronisation, it is tamper-proof and establishes trust in a transaction. This allows the transfer of anything of value between two parties without the need of an intermediary. Blockchain is emerging in healthcare as well as financial tech. In air transport, the technology can be the basis for virtual or digital passports that store biometrics in the form of a single secure token on a mobile or wearable device of the passport holder. Further potential usage would be in baggage tracking, cargo manifests, aircraft history and maintenance records, aircraft spare parts logistics and a lot more. What transactions can be simplified and made more secure using blockchain technology? How can it affect our supply chain and what ecosystems must be built? As the costs of Internet-connected sensors and networking equipment continue to fall, IoT (Internet of Things) technologies will continue to play a bigger role in efforts to make aviation more efficient and improve the passenger experience. While aircraft components such as engines have been providing real-time IoT data on everything from performance to required maintenance for some time, other industry players are increasingly finding new ways to deploy and use IoT technologies. Airports are deploying interconnected sensor networks and data hubs to track and understand passenger flows and behaviour in the airport terminal to drive retail revenues, reduce connection times or improve the boarding process. And on the airport premises, airlines and airports are using IoT technologies to locate and keep track of their equipment. Which activities can we learn more from through increased or improved monitoring? Which of our processes can be improved or made more efficient if we had more data? Keeping abreast of the trends affecting our world is of strategic importance and requires that you revisit your core assumptions on a regular basis. I observe that far too many executives devote their time to managing the day-to-day operation, and not nearly enough time to strategic and innovative thinking. Are you devoting equal time and energy to both? Business resilience is about adapting quickly to trends and technological disruption as much as it is about maintaining and safeguarding the business operation. In the end, it is all about staying relevant, by continually and perpetually innovating and creating business value. 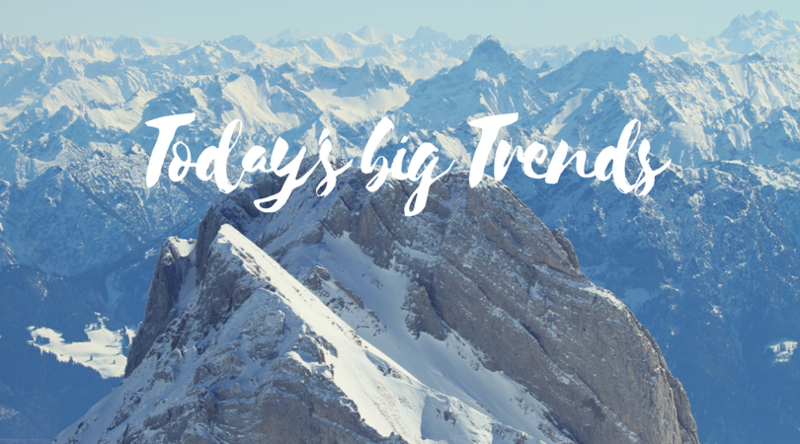 How can today’s trends become tailwinds for you and your business? P.S. Jeff Bezos’ 2016 letter to shareholders can be found here. I look forward to reading his 2017 letter, expected in the coming month.